It's a day about courage and determination. Regardless of whether they were first time participants or seasoned competitors, the recent 'National Inter-School Taekwondo Championship' (22-26 April) brought out the best in all our INDUK players. Many had to fight hard for their spot in the finals and a chance at a medal. However, everyone was a winner just by taking the challenge. Besides the 20-medal haul (8 golds, 5 silvers & 7 bronzes), some of our students brought glory to their respective schools. Tanjong Katong Primary School and CHIJ-Katong collected trophies for 'Overall 3rd Place Junior Boys' and 'Overall 3rd Place Senior Girls', respectively. 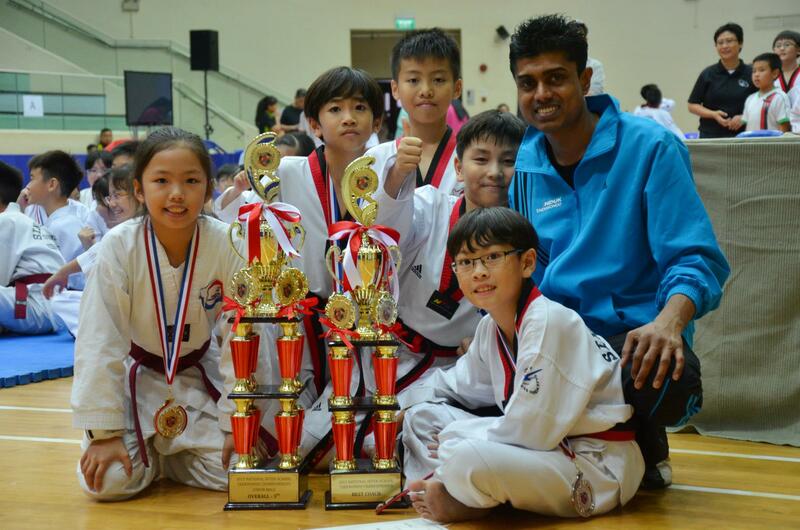 Coach Suren's efforts was also recognised with the 'Best Coach' award for the Primary school category; while our student, Bryan Yap who picked up a Silver in the Kyorugi (sparring) finals in his Junior category, was given the 'Sportsmanship' award. Kudos also to all parents who were there to cheer the team! For all the the action in the championship, click Day 1 & 2 and Day 3 & 4.